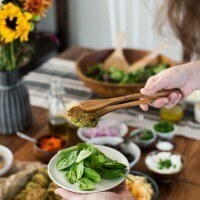 One of the earliest items I learned to make when I first started cooking happened to be baked falafels. I had fallen in love with falafels thanks to a local Greek restaurant near school but once I moved away, I had major falafel withdraw. And so, I decided to learn to make them at home, only slightly healthier. I’d be lying if I said the baked version was just as good as the fully fried version, which is why in this recipe, I split the difference and do a shallow fry. You will also notice that I didn’t go the traditional route and use dried chickpeas. This is for one primary reason: I have a hard time planning ahead and when I want to eat falafels, I want them now. I use the oven to help dry out the chickpeas slightly, which helps keep the moisture levels a bit closer to the traditional recipe. 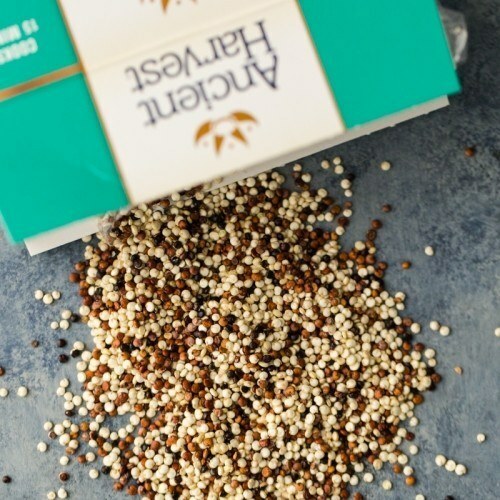 While this recipe can be made without the quinoa, I like the extra bit of texture the cooked quinoa provides. Preheat oven to 350˚F. Drain, rinse, and pat dry the chickpeas. Spread out into a single layer on a sheet tray with sides. Bake for 10 minutes, just enough that the chickpeas start to look a bit dry. 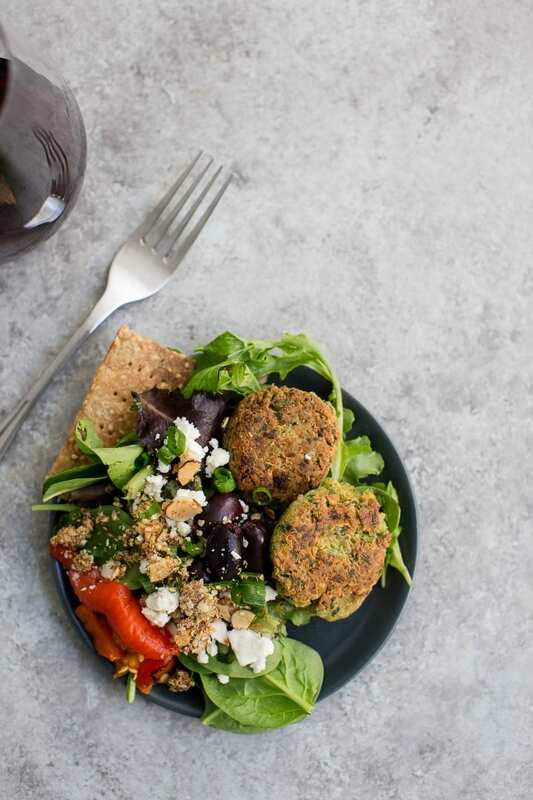 + If you would like to bake the falafel instead, heat oven to 400˚F and bake the falafel for 10 minutes, flip, and bake for another 5 to 10 minutes. +Adapted from this Martha Stewart recipe. Since this was a party highlighting quinoa (thanks to Ancient Harvest), I went all out with the quinoa options. 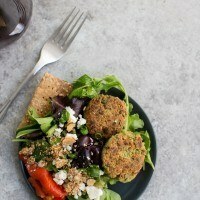 I used whole quinoa in the falafel, made quinoa granola but used honey in place of the maple syrup and added a pinch of cumin, and made quinoa crackers using quinoa flour (recipe coming soon). 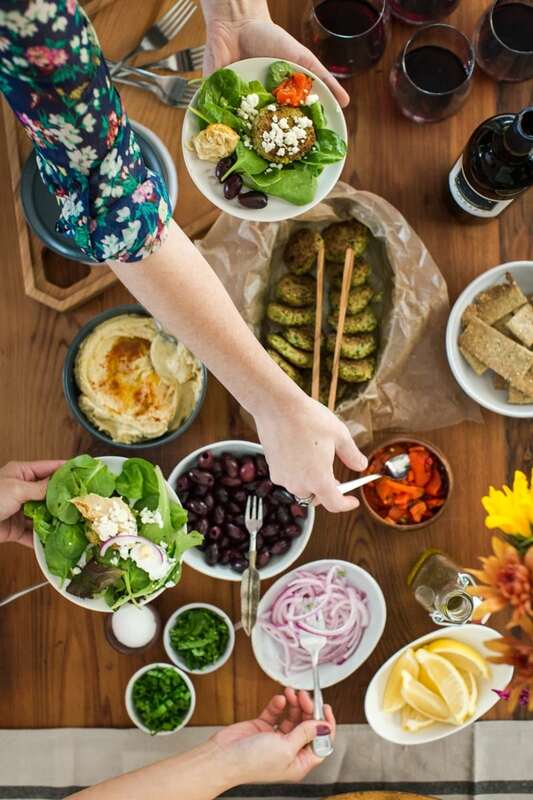 Of course, that was just the start for this falafel party. 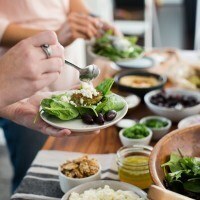 The Toppings: I usually go all out on the toppings including roasted red pepper, kalamata olives, feta, hummus, parsley, cilantro, lemon juice, and red onions. 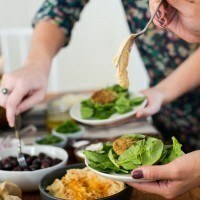 The Base: We did falafel salads but you could also supply pita for stuffing these patties inside. The Wine: I like to stick with the Pinots (gris + noir). The gris plays on the herb-forward parts of the falafel while the noir (I think) is great with the earthiness of chickpeas/quinoa. Oh wow!! 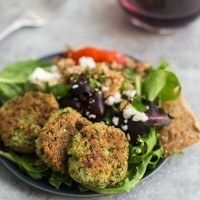 This falafel sounds incredibly easy Erin! I love it! 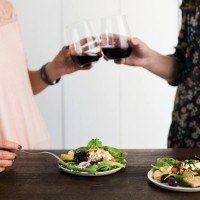 Is the 1/2 cup quinoa cooked or uncooked? This looks great. I love falafels and I love quinoa. Thanks for another great recipe. I’ve been craving something warm, crispy, and filling for the winter. Quinoa seems like the savior for that, as I just made a recipe making it into a hearty mapley porridge! This was delicious and so easy to make!! 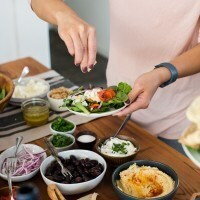 The thought of falafels was intimidating- I was so surprised at how simple it was. The flavor was great, this will become a regular item mixed into our meals. I’ve never tried but I think they could. I would shape the patties and freeze before cooking, then thaw and then cook. Flax or chia egg should work!